The In-Depth Genealogist – Digital Magazine – Issue 6 – OUT NOW! The next issue of the free digital magazine is available NOW! take part in the Forum. 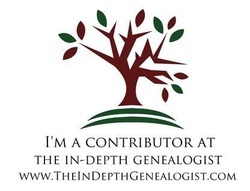 You can read my Introduction post HERE and you can follow the column by visiting The In-Depth Genealogist website and subscribing via email or via twitter and Facebook. This is a great addition to the genealogy market and I am very proud to be a part of it. This month’s Across the Pond column is about Census Alternatives. This entry was posted in Uncategorized and tagged In-Depth Genealogist. Bookmark the permalink.